Our shorts and swimsuits have been put away and our bodies are covered up. Have you noticed an extra roll on your stomach? Do you hide it by putting on a larger shirt? We usually put on 1 - 2 kg (2-4 pounds) in the winter. Why? 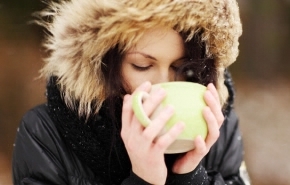 In most cases, people feel they need to eat more to maintain their body heat. Unfortunately, white fat tissue (the kind under your skin) stores up energy, while brown fat (the kind we’ve had since birth) burns calories to heat the body. Only white fat accumulates when we put on weight. 1.When it is dark and cold, we tend to stay home and watch TV or surf the internet. It’s fun to watch your favorite show and eat snacks. Choose snacks that will not contribute to fat tissue growth like healthy cucumber or carrot sticks dipped in spiced or flavored yogurt, or roasted zucchini strips. 2.In winter, we tend to choose fatter, sweeter, more calorific foods. When it’s cold and dark, our mood is worse, therefore snacks that satisfy cravings quickly make us feel better. 3.Winter weather is not encouraging to go out and do shopping, so when our fridge is empty, what do we do? “Let’s order take-out!” Unfortunately, take-out rarely offers healthy and lean meats with brown rice and salad, it mostly consists of staples such as pizza, burgers, or oily Chinese food. How to avoid this scenario? Keep a stock of kasha, brown rice, beans, peas or lentils in your pantry and frozen veggies with lean chicken breast in the freezer. Cook them up, add a healthy sauce from your pantry or salt and pepper with olive oil, mix in some mustard and voila! - you have a healthy meal. No more excuses! 4.Choosing foods that are high in simple carbohydrates (candy bars, white bread) leads to sudden drops in blood glucose levels, which quickly makes us crave for another snack. Keep that in mind and it will help you choose a healthy snack next time. 5.Eat more proteins and healthy fats; these energy sources will not make your blood insulin levels fluctuate and you will begin to lose weight naturally. Eating high quality meats that are rich in zinc as well as fish, eggs, olive oil, nuts, and lots of vegetables – avoid simple carbohydrates. 6.It’s dark by the time you get home from work. You planned to exercise, but you put it off until “tomorrow.” Unfortunately, we exercise much less in the winter. That’s because it’s darker, colder and we have less energy. To maintain a good level of exercise, pick an activity you like the most. You don’t have to bench press tens of kilos in the gym. Choose classes you enjoy and go with a friend so you can support each other. 7.Drink less coffee from coffee shops. Because it’s colder outside we often choose a hot latte or mocha, usually with cinnamon but also whipped cream and sweet syrups. Tons of empty calories! 8.Go outside! It turns out that lower levels of vitamin D (also associated with lower calcium levels because you need vitamin D to absorb calcium) make you put on weight faster. Dress warm and get outside for a walk when the weather is nice. Another solution, eat vitamin D3 and calcium supplements. 9.Get a good night’s sleep! 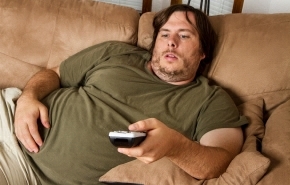 Research shows that if we don’t get enough sleep, we put on weight. Our bodies have higher cortisol levels, resulting in higher blood sugar levels. At night, when insulin should not be secreted into our blood (in reaction to blood sugar), our body turns energy (from sugar) into fat, i.e our body reserves. So, turn off the TV and go to bed! The season is changing – adapt your diet habits to the changes to gain satisfaction from this time of year, instead of gaining weight! If you have more questions, contact our specialists.